I've seen them before, and I've taken several photos of them. But it has been either to early or two late and it hasn't been light enough. Well, these pictures are not fantastic — a photo taken through a closed window won't come out much better. Especially since I don't remember when those windows were cleaned last. They're so beautiful that I don't mind that they seem to like the same flowers as I do. The birds are VERY safe here! The sad thing is that we have very few birds this cold winter. I'm afraid it is partly my fault as I haven't been able to buy them food when the car has been on strike. Sa vackert. Era radjur ar inte like vara...dom ar bulligare i Sverige pa natt set. Har har dom ochsa en ratt long vit svans som dom sticker rakt up i vadret nar dom blir radda. Jag tror att det finns fler sorts hjortar i USA än här. Hur det är med hjortar vet jag inte, när det kommer till fåglar har vi nästan inga gemensamma fåglar i Sverige och Amerika. De kan vara snarlika - men skiljer sig i regel åt på flera punkter. Jo, våra rådjur har också en vit svans som sticker rakt upp när de flyr. So beautiful! 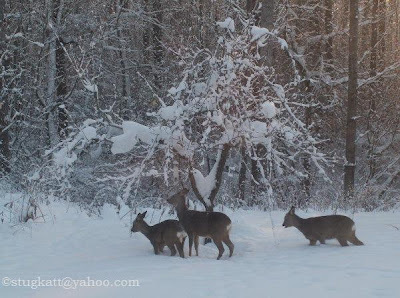 They look a little different from the deer that come to my yard which are white-tailed deer. But they do all charm us into forgiving their depredations! I don't believe you can take a bad photo. 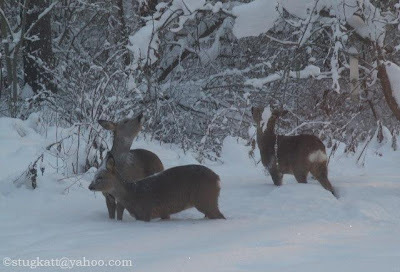 :) btw what kind of dear are they? 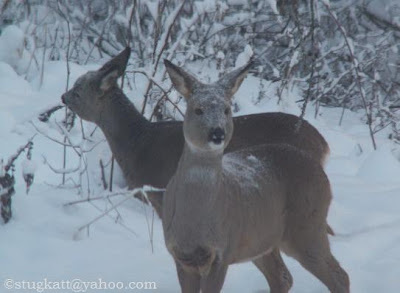 the shape of thier heads are much different then the dear I've seen in my neck of the woods. According to my dictionary this deer is called roe deer in English. I don't know if you have them in the States. The only deer I've seen when I've been there are mule deer, I think they are larger. They all are beautiful though.